This instalment of our Growth to Watch For series picks up where we left off in our last instalment, meandering north through North York with an overview of all of the activity happening above the 401 and west of Yonge to the 400. 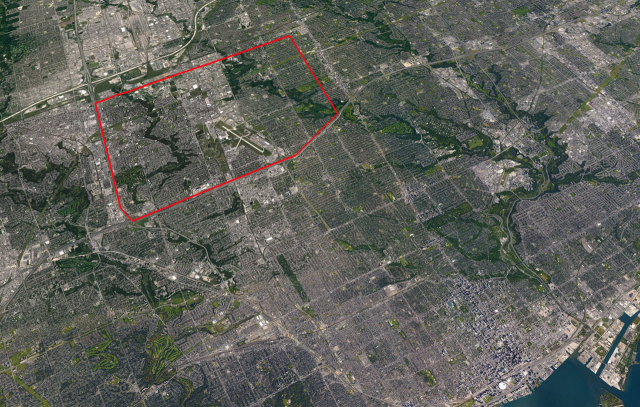 Despite the 60 km² area's distance from many of the centres of activity throughout Toronto, there is still quite a bit of development happening in the western half of North York, with growth along the Sheppard corridor, the redevelopment of Downsview Park, the recent opening of the subway extension, and the expansion of major institutional campuses. This instalment will take you on a 35.5 km path covering all developments currently under construction, and many the proposals across various stages of the planning and approvals process. Picking up where we left off on Wilson where it passes under the 401, we continue west a few blocks. 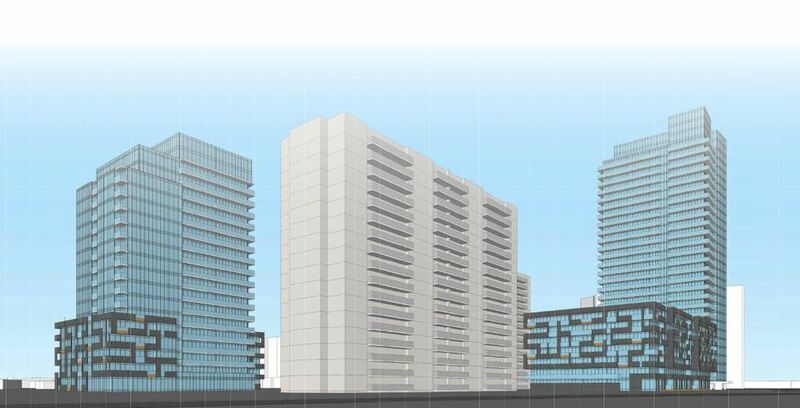 A 2016 plan from Collecdev for 470 Wilson Avenue, near the Allen, calls for an imposing groundscraper designed by gh3. The plan seeks rezoning for a 13-storey condominium building, a 12-storey rental building, and a series of 4-storey stacked townhouses with a combined total of 623 new residential units. The project has been appealed to the Ontario Municipal Board (OMB), and City Planning staff have recommended that Council send staff to oppose it. A prehearing is being held later this month. A block to the west, a pocket of density surrounding Wilson Subway station continues to grow following the completion of Gramercy Park by Malibu Investments' and Station Condos on the Subway by Brandy Lane, Shiplake, and Wise. The next project to add more life to the area will be Malibu's second phase of Gramercy Park, dubbed Southside Residences. The project's 15 and 17-storey Page + Steele / IBI Group Architects-designed towers will add roughly 500 suites to the neighbourhood once complete in 2019. Opposite on the west side of the road, another 2016 application from Malibu sought rezoning and an Official Plan Amendment (OPA) for a trio of towers with heights up to 16 storeys at 4-6 Tippett Road. Now being marketed as Express Condominiums on the Subway, the 651-unit project by RAW Design is due for an OMB hearing in March to determine the next steps for the project. Rendering of Express Condos, image courtesy of Malibu Investments. Just to the north, construction is underway at the Tippett Road and Wilson Avenue site of Metropia's Rocket Condos, a 13-storey 242-unit condo building designed by gh3. Crews are now in the process of excavating the building's underground garage and work here will continue throughout the year. Rocket Condos would be followed by a second phase 8-storey 154-unit residential building erected to the south of Station Condos at 36R Tippett. Also designed by gh3, developers Metropia, Shiplake, and Wise are bringing this building which would contain 100 affordable housing units, half of which will be rentals and the other half of which will be for purchase. Renderings from 2017 show a machined aesthetic with undulating balconies. Collecdev and gh3 are working together on another project on this block, this one at 30 Tippett Road. The 2017 proposal for OPA and rezoning, seeking 13 and 14-storey residential buildings and a park dedication, is currently working its way through the planning process, with community consultations expected to take place in the coming months. Several hundred metres west, past Allen Road and just east of Dufferin Street, an early 2017 application for one-and-three-storey commercial buildings at 725 Wilson Avenue has evolved since its initial submission. Resubmitted for Site Plan Approval (SPA) in the final days of the year, the current plan calls for an SMV Architects-designed office and retail building with a total gross floor area of 7,706 square metres. Continuing west on Wilson to Dufferin Street and turning south, we arrive at the site at 3621 Dufferin Street. Here, Dymon Storage has proposed a uniquely mixed-use 9-storey, TACT Architecture-designed building containing 141 residential condo units wrapping around a storage locker facility. Submitted for SPA in December, 2017, a recent City notice reveals that the project's Preliminary Report will be made available prior to an upcoming February 21st meeting of North York Community Council. Backtracking to Wilson Avenue and continuing west, a 2016 proposal from Time Development Group seeking OPA and rezoning for a 9-storey mixed-use building between Keele and Jane streets at 1326 Wilson Avenue was resubmitted for SPA in August, 2017. The AJ Tregebov Architect-designed project is now planned to rise ten storeys, and contain 95 residential units, 1,543 m² of retail space, and medical offices on the 1st and 2nd floors. South and east elevations of 1326-1328 Wilson, image courtesy of Time Development Group. Moving further west, we arrive at Jane Street and divert north to 160-200 Chalkfarm Drive, where Verdiroc and WZMH Architects submitted a proposal for infill development at a suburban Tower-in-the-Park site. 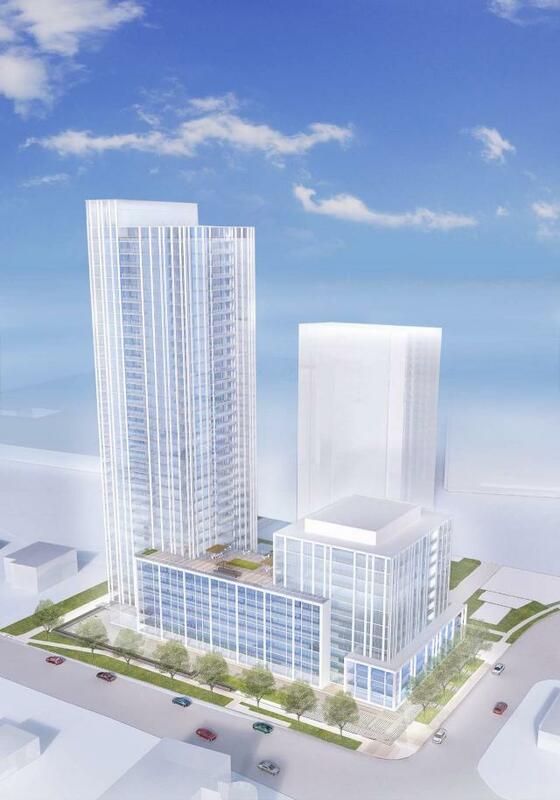 The late 2016 plan called for a 36-storey residential tower with almost 600 new rental units. The project has since been appealed to the OMB, though no scheduled hearings have yet to be made public. Rendering of 160-200 Chalkfarm, image courtesy of Verdiroc. Backtracking over 2 kilometres east and turning north on Keele Street, we pass the 2017-completed The 2800 Condos and continue northbound, arriving just south of Downsview Park. Here, Stafford Developments is preparing to break ground on their 155-unit Luxury Townhome Collection at Downsview Park project after seeing successful sales in 2017. The Turner Fleischer Architects-designed project's 3 and 4-storey townhouses are expected to begin construction this spring. 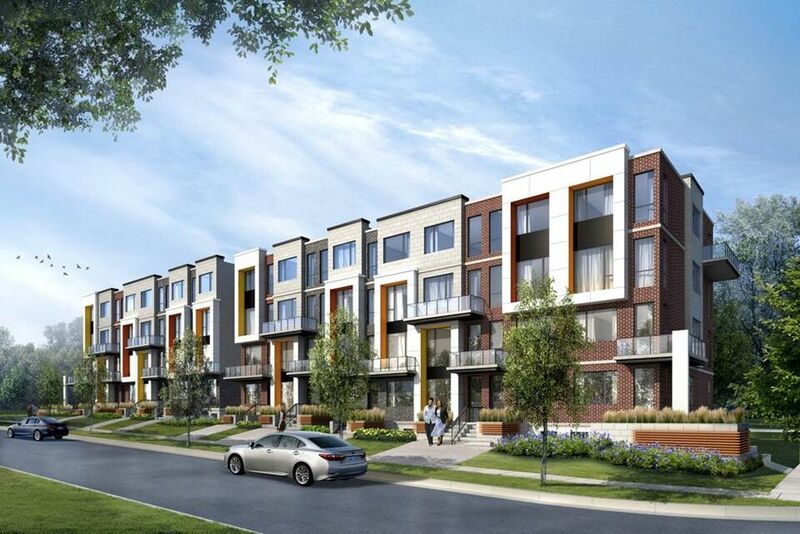 Rendering of the Downsview Park Townhomes, image courtesy of Stafford Homes. Continuing north along the west edge of Downsview Park, an OMB-approved plan for 3100 Keele Street is now being marketed as The Keeley. Taken through rezoning by the Decade Group, the property was purchased in 2017 and is now being headed by TAS and Fiera Properties. While we only have a rendering for the SMV Architects-design which was proposed for the rezoning, we expect to have renderings of the new Teeple Architects design for TAS shortly. If it fits the recent zoning amendments to a T, it will introduce 325 condominium units to the neighbourhood, as well as new at-grade retail space. 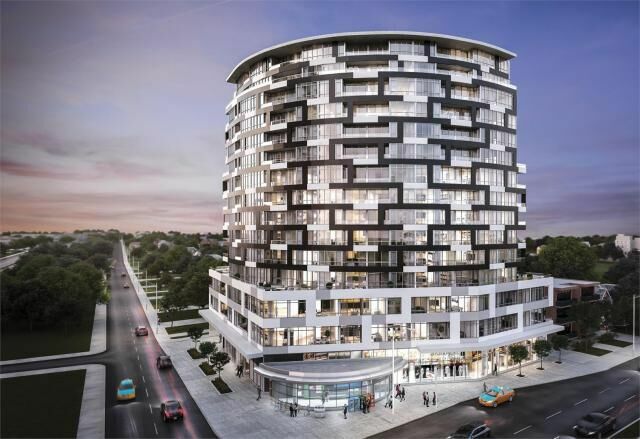 Rendering of 3100 Keele, image courtesy of Decade Group. Moving north on Keele, we arrive at Sheppard before starting a short diversion to the west. At the corner of Sheppard and Seeley Drive, a 2016 proposal for 1629 Sheppard Avenue West seeking rezoning for 4 pairs of semi-detached houses was resubmitted for SPA in October 2017. Reversing course, we head east along Sheppard, passing the recently opened Downsview Park Station, bringing subway and GO service to the area. 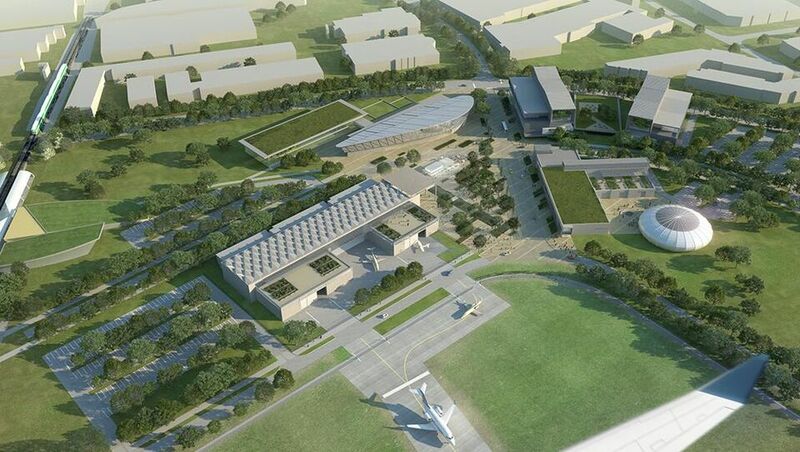 A short distance east of the station, a 1929-built De Havilland aircraft plant on the former Downsview military base is being repurposed to serve as the new home of the Downsview Park Aerospace Campus of Centennial College. Construction of the MacLennan Jaunkalns Miller Architects (MJMA) and Stantec Architecture-designed facility is well underway, with the campus set to open this fall. Rendering of the Centennial College Downsview Park Aerospace Campus, image courtesy of Centennial College. Continuing east and crossing Allen Road, we arrive at the site of Urban Capital and ALIT Developments' dormant Futura Condos project, directly east of Sheppard West Station's north entrance. The 199-unit, Wallman Architects-designed condominium development was approved by the OMB at 14 storeys in 2015, with the site put up for sale later that year. We do not know if the site has been purchased, or when there may be any news here. 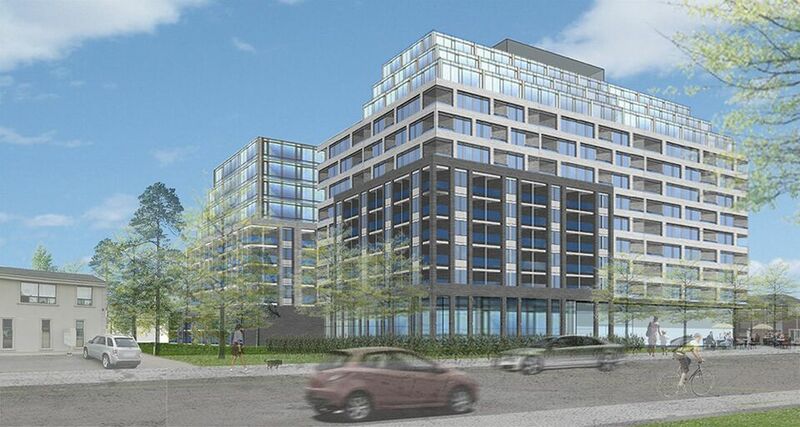 Rendering of Futura Condos, image courtesy of Urban Capital and ALIT. Just to the south, a district plan is in the works by Build Toronto for the Allen District, a 54-acre plot of land stretching south from Sheppard West Station that the City wants to develop into a mixed-use neighbourhood. After an extensive consultation process that continued into 2017, a draft plan of subdivision zoning by-law, and environmental assessment consultation process are expected for 2018. 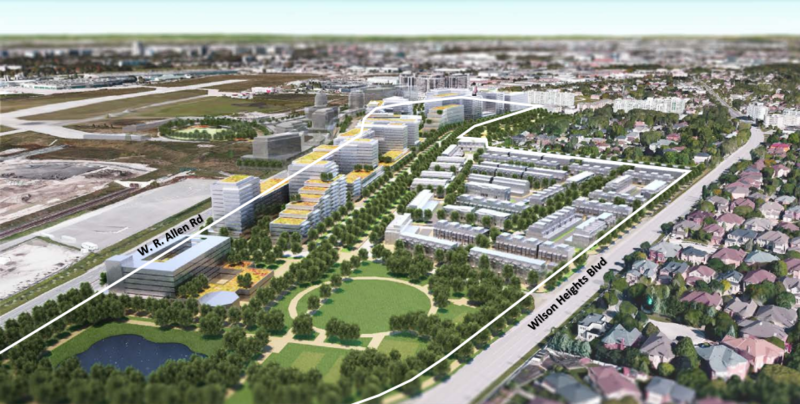 Included in the Allen District coverage area, the lands immediately east of Sheppard West Station would support mid-rise office uses at 1035 Sheppard West. Conceptual massing of the Allen District, image courtesy of Build Toronto. Continuing eastbound on Sheppard, we arrive at the corner of Faywood Boulevard, where a two-building proposal dating back to 2005 at 847-873 Sheppard West changed hands in 2017. Evolved from a 2016 plan, a September 2017 resubmission from Crown Communities for OPA, Zoning Bylaw Amendment (ZBA), and SPA calls for 172 stacked, and back-to-back townhouses arranged in 7 blocks, designed by SRN Architects. Further east on Sheppard, Greenfield Quality Builders' proposed Sheppard and Gorman Park Condos—named for the intersection it would occupy—was proposed in 2016, and appealed to the OMB in 2017, with no hearings currently scheduled. 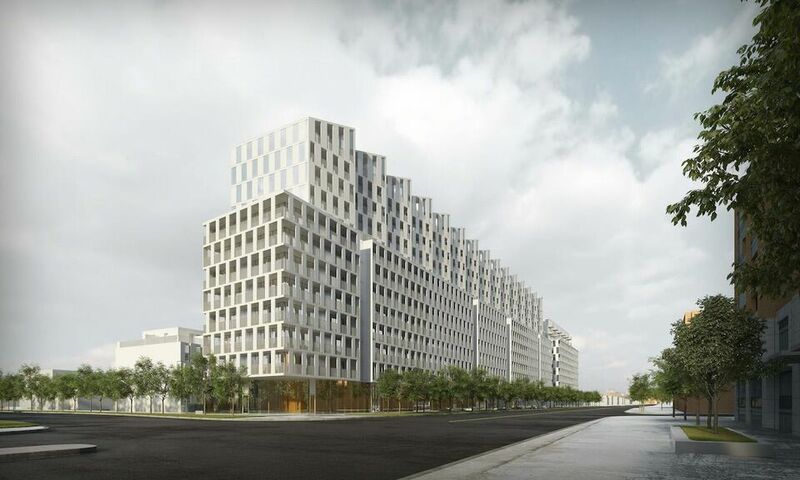 The 9-storey building designed by superkül would add 85 condominium units to the neighbourhood. A bit further east on Sheppard, a pair of 9-storey Kirkor Architects-designed proposals at 813 Sheppard West and 740-748 Sheppard West are near mirror images of one another. The former was resubmitted to the City in October 2017, while its sibling project to the east has already been approved. Both sites were recently listed for sale by CBRE, meaning we could learn more following a potential sale of the sites. Just across the street, Torbel's Diva Condos is now topped out at 9 storeys at 741 Sheppard Avenue West. The structurally-complete KFA Architects-designed building will wrap up construction later this year, bringing over 100 new condominium units to the neighbourhood. Moving east, an OMB-approved mid-rise condominium plan for 719 Sheppard West has remained dormant for a few years, but updated renderings were found on the website of Icon Architects in early 2017. While this was initially interpreted as a sign that the project might be revived, the site has since once again fallen inactive, and it's anyone's guess as to whether this one will reappear in 2018. Rendering of 719 Sheppard West, image courtesy of Icon Architects. Right across the street from the 719 Sheppard site, Quadcam Developments' plan for Westmount Boutique Residences at 700 Sheppard West was resubmitted to the City for OPA and ZBA in August, 2017. With the proposal's history dating all the way back to 2011, the 10-storey, KFA Architects-designed condominium development with ground floor retail is now one step closer to approval. The latest plan has been reduced in scale, from 134 units down to 128. The wall of proposed mid-rise density continues to the east, where a 2016 proposal at 665-671 Sheppard West evolved in 2017. The SRN Architects-designed project by Crown Communities, now known as Clanton Park Towns, is proposed to rise 5 storeys from Sheppard at Yeomans Road, containing 51 townhome units. An official website for the project is now taking registrations. A block and a half to the east, we arrive at Bathurst and duck south from Sheppard to a vacant site at 4362 Bathurst that has been awaiting redevelopment for years now. Rezoning for an 8-storey mixed-use residential and retail development was approved for back in 2012 and a single-family detached house occupying the site was demolished in 2015. A "for lease" sign was added to the vacant site in 2016, though no activity was recorded in 2017. Turning around, and heading north past Sheppard, an expansion of the Prosserman Jewish Community Centre is underway at 4588 Bathurst following a Fall 2017 ground breaking ceremony. The 9,930 m² (106,000 ft²) IBI Group-designed expansion—to be known as The Sheff Family Building—will contain a daycare, fitness centre, art gallery, studio, chapel, theatre, offices, and more. The $72-million project will remain under construction through 2018. Back on Sheppard and continuing east, a late 2016 proposal seeking significant density at 325 Bogert Avenue was issued a refusal report from the City in 2017. The plan from Greatwise to add six residential towers ranging in height from 21 to 37 storeys to the site of an existing three-to-six-storey rental apartment complex was appealed to the OMB following the refusal, and is due for a prehearing on February 22nd. A 2012-approved plan for a 6-storey, 42-unit development at 258-262 Sheppard Avenue West resurfaced in 2017 following a sale to Park Hiatt Developments. Now known as The Addington, the project was resubmitted last year as an eight-storey, 163-unit Kirkor Architects-designed condominium development. The Addington has since been appealed to the OMB, with a prehearing scheduled for May 28th. 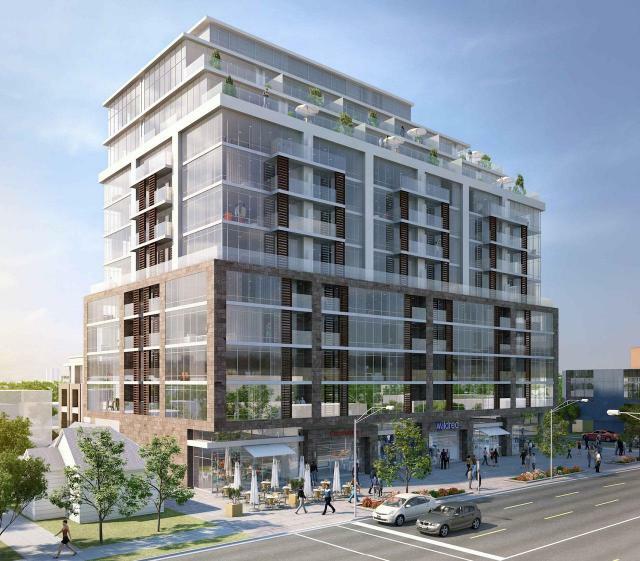 Steps to the east, another mid-rise proposal at 245 Sheppard Avenue West from developer PineLake Group and WZMH Architects was refused by the City in 2016. 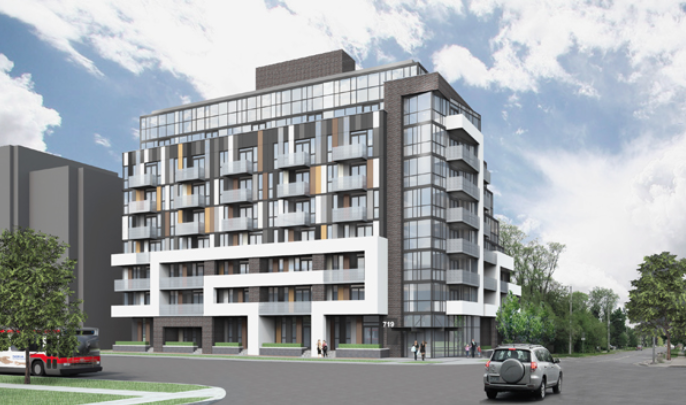 The plan for an 11-storey condominium building and a block of seven three-storey townhomes was appealed to the OMB last year, and a hearing is planned to take place between August 20th and 31st. 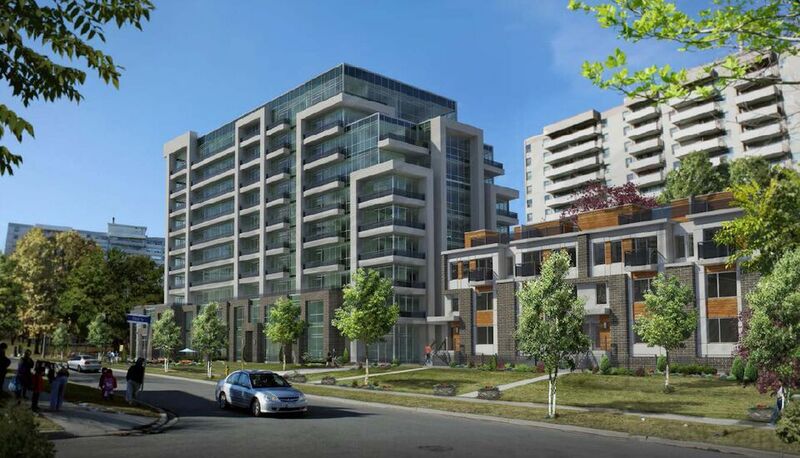 Rendering of 245 Sheppard West, image courtesy of the PineLake Group. Turning north on Senlac Road, we pass through the York Cemetery, where a one-storey addition containing a visitation room, an exterior patio area, new storage space and corridor connections to the existing facility was proposed in late 2017. Designed by Hatch Architects, 101 Senlac is currently under review by planning staff. Continuing north up to Finch, we hang a left and continue westbound for a few blocks before reaching a mid-rise proposal at 221-231 Finch West. Dating back to 2013, the Icon Architects-designed plan has evolved quite a bit over the years, and was most recently proposed at four storeys with 91 residential units. An OMB hearing scheduled for April 2016 was cancelled, and the City issued Notice Of Approval Conditions (NOAC) the following month. No new activity has been recorded in 2017, though we'll be sure to our eyes peeled for movement. Rendering of 221-231 Finch West, image courtesy of Icon Architects. Across the street to the north, a long-dormant infill townhome proposal at 228 Finch Avenue West resurfaced this month with a resubmission to the City. The latest plan from architects Line & Page seeks rezoning for a four-storey, 40-unit townhome development. The resubmitted plans are now under review by City staff. A few doors to the west, a late 2016 rezoning application for 240 Finch Avenue West remained dormant in 2017. The plan from design/build firm Urbanscape calls for 6 connected three-storey freehold townhouses with heights of 11 metres. Continuing west towards Bathurst Street, a 2016 proposal for 286 Finch West was resubmitted for rezoning last year, seeking a three-storey stacked townhouse building with 25 units, to share the site with an existing four-storey rental apartment building. An OMB appeal has since been filed for the Kirkor Architects-designed project, though no hearings have been scheduled as of yet. 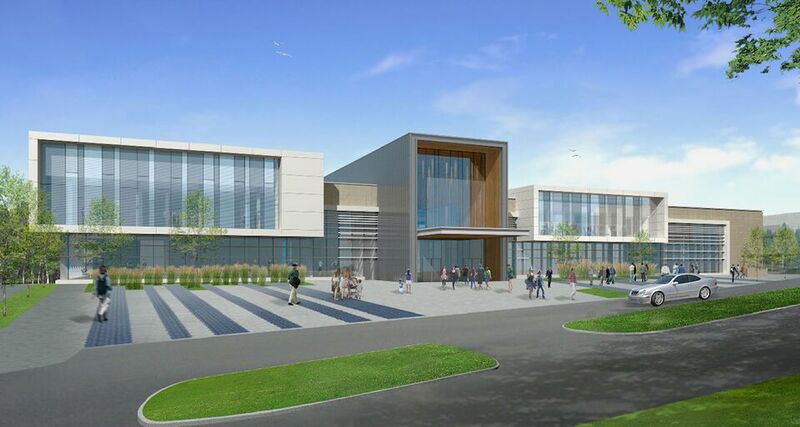 A half-kilometre to the west, North York General Hospital's (NYGH) former Branson campus will soon be transformed into a seniors care centre by Advent Health Care. The first phase of development at the 555 Finch West site will be a 5-storey building containing long-term care, supportive housing, and assisted living units for seniors. While the project's necessary OPA and rezoning were granted in 2009, the City only issued NOAC last year shortly before the hospital's Urgent Care Centre closure. NYGH's lease of the site will be terminated next year. Moving west another half-kilometre brings us to the site of 591 Finch West, between Bathurst and Dufferin. A 12-storey 78-unit residential proposal by Keith Loffler McAlpine Architects was approved for the site by City Council back in 2014, though almost four years later, the site remains vacant and no new information has emerged. Almost three kilometres to the west, and just a block from the new Finch West subway station, construction is progressing at Haven Developments and Union Capital's 8-storey, 180,000 ft² University Heights Professional and Medical Centre. The ACK Architects-designed office condominium development rose above grade last year, and is now ascending above the Finch and Tangiers Road intersection. Construction here is expected to wrap up later in 2018. Continuing west past Keele Street, we reach Sentinel Road and turn north. Passing a Tower-in-the-Park style rental housing community with a dormant 2006 intensification plan at 470 Sentinel Road, we arrive at York University, now home to its very own subway station on the Toronto-York Spadina Subway Extension. At the north end of Sentinel Road, we turn east at The Pond Road, passing the 2017-completed the twin buildings of The Quad Student Residence and turning north, arrive at the site of the new York University Student Centre with architecture by Cannon Design. Marked by a dramatic cantilevered volume, the structurally-complete four-storey building is on track to open this year. Once complete, it will introduce new study space, meeting rooms, club and student offices, administrative spaces, lounge areas, recreational uses, and more restaurant/retail space to York University. At a similar stage of construction progress, the Rob and Cheryl McEwen Graduate Study & Research Building at York University's Schulich School of Business is adding 67,000-square-foot (6,225-square-metre) of space to the school. Designed by Baird Sampson Neuert Architects, construction is scheduled to wrap up this year. Passing by the newly-opened York University Station and threading our way through the campus past its second subway stop at the north end—Pioneer Village Station—we turn onto Steeles Avenue, heading east. Passing Dufferin Street and the West Don River, we arrive at 1755 Steeles Avenue West, a site owned by pharmaceutical company Sanofi Pasteur, formerly the University of Toronto's Connaught Laboratories site. Here, Sanofi Pasteur is expanding the site with a 3-storey, 15,000 m² manufacturing building on the southern portion of the site. The project was approved by Council in 2017, and is underway. Following east on Steeles again, we arrive at Bathurst where we turn south for just over a block. A 2016 proposal from Pinedale Properties for their Tower-in-the-Park residential community at 6040 Bathurst Street would add a 19-storey rental tower and a 29-storey condo tower amongst existing buildings. Designed by the IBI Group, the plan was appealed to the OMB last year, and a prehearing was originally scheduled for February 23, 2018. The OMB file has since been updated to "adjourned" and no further hearings have been scheduled, meaning a settlement may have been negotiated behind the scenes. If so, we will hear more soon. 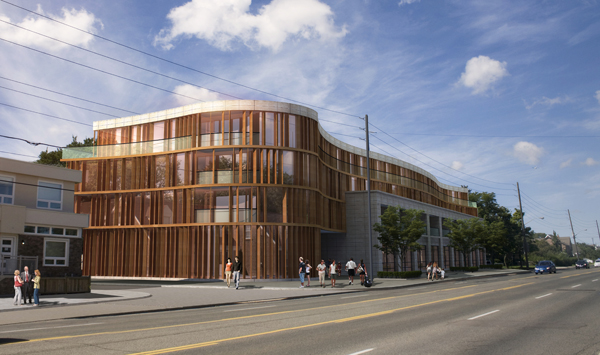 Rendering of 6040 Bathurst, image courtesy of Pinedale Properties. Returning north along Bathurst to Steeles, we resume our eastward trek, arriving at a 1970s-built 15-storey rental apartment building at 755 Steeles Avenue West. A plan dating back to 2014 seeks infill development here, with a 10-storey residential building, 2-storey townhouses, 4-storey, stacked, back-to-back townhouses, and a single-storey retail building. A refined proposal for the Rafael + Bigauskas Architects-designed project—known as Marcher Towers—was resubmitted for ZBA in June, 2017, and is now under review by City staff. We end our journey through the western half of North York approaching Yonge Street. Next up, our Growth to Watch For series heads south through North York Centre and turns eastward along the Sheppard corridor through Willowdale, summarizing all the development happening in the eastern half of North York. In the meantime for more information, make sure to check out the database files and Forum threads linked below for each of the projects mentioned. You can tell us what you think of all the developments happening in the city by joining the discussions in the associated Forum threads, or by leaving a comment in the space provided on this page! 3621 Dufferin, a proposed mixed-use storage/residential/office/retail mid-rise building in Toront's Downsview area, designed by TACT Architecture for Dymon Storage. An 11-storey mixed-use development by PineLake and WZMH Architects at 245 Sheppard Avenue West containing 105 residential units, including 7 three-storey townhomes. A new 4-storey student centre is under construction at York University, with completion expected in 2018. Designed by CannonDesign.